We all are familiar that iPhones can give you directions, let you surf the web, and do about a thousand other things, but what if you want to get a close look at something very tiny? Well, the phone can't help you with that on its own, but it can if you provide it with the Mini Microscope for iPhone. It mounts over the lens of the phone's camera. Once in place, you can use it to look your thumb, get to recognize the insects in your locality, or even to distinguish fake money. The Mini's 60x magnification lens is attached to an adjustable-angle three-bulb LED light supply. Two of those bulbs are white, for regular little-thing illumination, while the third can be used for verifying watermarks on paper currency. The lens/lights assembly attaches to a sleeve-like covering that slips over the top of an iPhone 4 – if you've got any other model, you'll just have to narrow your eyes a little harder for garden bugs. 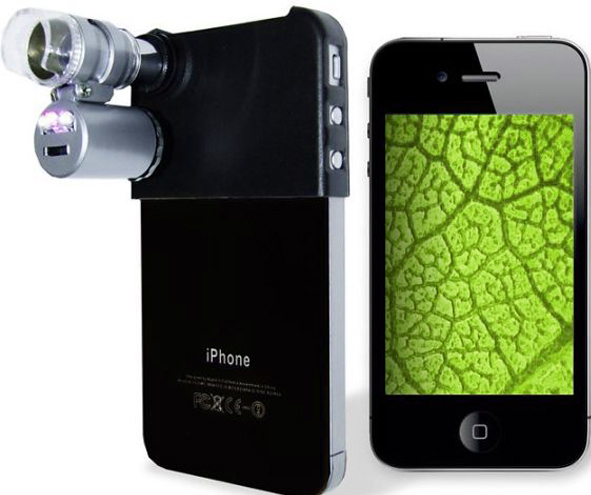 Aspirant scientists – or even the real thing – can buy the Mini Microscope for iPhone from Britain's Firebox for GBP 29.99 (about US$48) plus shipping.